.4 (Constantine) Releasing to Testers This Week! First of all, it’s very exciting to see so many new people on the blog! Thanks to RPS for their very positive article! We are working hard on getting the AI implemented and the gameplay balanced as our testers will be working on this. Look for more screenshots and an updated video shortly on our YouTube channel! Also, with the release of .4, we will be increasing the tempo of blog and forum updates, as well as working on our web site design. 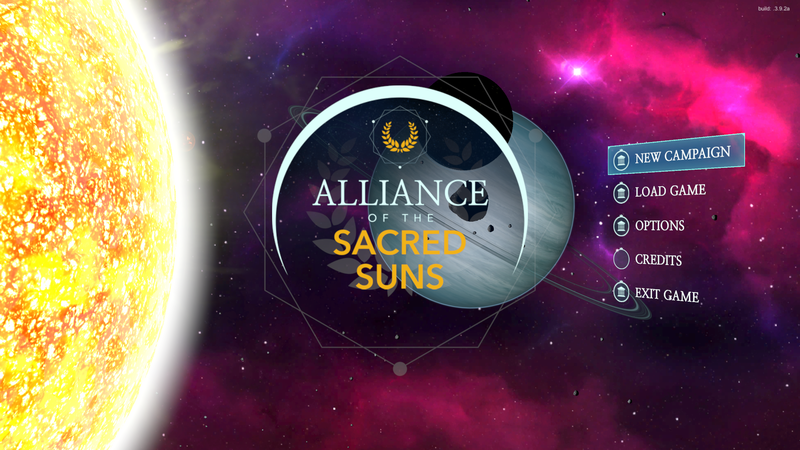 We will move to www.allianceofthesacredsuns.com shortly once our new web site is live. This blog will be moved there as part of that redesign. Most exciting, we are planning to release our Phase One of our early access build before the end of the year! We will add more information about pricing and dates shortly. Status Report! .2 Alpha To Release Next Week! So we’ve been pretty quiet for the last month or so. What we’ve been working on doesn’t lend itself to pretty screen shots or 3D wonder. No, we’ve been working on the baseline game features, the AI, and the player experience. It’s all pretty gnarly as far as something to post, and honestly I’ll let Oliver, our AI guy, talk about it in more detail, but basically it’s going to be as close to a living world with full characters in a 4X as has ever been seen. Your emperor will walk amongst fully-realized personalities, each with their own traits, abilities, goals, and morality. We have revamped the character attributes to be more in line with the new ‘Aitvaras’ AI system we have been working on. Characters will be able to determine their relationships with each other, determine their short and long-term strategies depending on those relationships, their ambitions, and the ambitions of their House and/or their civilization. It does sound like CK in space, to a point. There are some similarities, to be sure. But we want each experience with talking to a character to feel like you’re talking to a real person. Where you might have 5-6 real options and no real feedback in CK, in Imperia you might have dozens of actions, many of which could lead to other actions, depending on what you say and how the character responds. We want these characters to feel real, and you should be able to understand what they want to do and be able to influence those actions if they are not in your best interests. That’s the real heart and soul of Imperia, something we’ve talked about since the very beginning. You are not the absolute master of your domain. Things are happening all around you, all the time. You can choose to do nothing, and the Empire will still run. Planets will get developed, the budget will be passed, and characters will seek to achieve their personal ambitions with or without your stamp. You must use the tools of Empire to shape your civilization. Every month, what you do has an impact. You have the power to destroy planets, to colonize and shape constellations, to go to war with every other civ in the galaxy – but at what cost to your rule and your people? You can rule as the most feared tyrant in the quadrant, but if people start to leave your Empire, you have no one to blame but yourself. You can have people assassinated who displease you, but remember that people have friends… and long memories. Each action you take WILL have a reaction – but that reaction is not always immediate, just as in real life. So we’re finalizing that AI plan. We already have some of the data programming in place. Next week will mark the release of .2 – with character Actions and the new speech system, you will be able to commuicate with your people and your characters, and start to shape your Empire. The economy is already pretty much done, though we’re still tweaking the trade system. We’re also updating the AI – adding constellations as provinces will change the game play significantly. There’s a lot to talk about next week, and we’ll have some new screen shots soon! Also, look for a new video update next week and perhaps some podcast appearances! We’ll post the time and date on the site as we confirm them. And…. looking towards next month, we are starting to design the new web site! We will have our own web site that is dedicated to Imperia, as part of a larger company site (KatHawk Games) so be looking for that as well. 163,935 visitors have come to learn more about Imperia. Thanks for being one of 'em!